* Search for a chance to win prizes instantly. * Earn points with each search towards Winzy’s month-end sweepstakes. * Invite friends and win even more. If a friend searches and wins, the person who referred them will win the same prize. Since Winzy’s launch in April 2006, Winzy has given away almost 200 iPods, 2,000 Amazon.com and iTunes gift certificates, and monthly grand prizes including Xboxes and $500 in cash. In addition to searching, winners on Winzy are able to play games for even more chances to win fun prizes. * Winzy Prize Wheel. Just spin the wheel to win Winzy Points, Amazon Gift Certificates, and iPods. * Winzy Lucky Sevens. A slot machine that is free! Pull the lever, land on 777 and win an iPod Nano. * Winzy Secret Suitcase. There are eight suitcases, each containing a prize. Open one suitcase at a time until there is only one left. The player wins the remaining prize. Many Winzy members are amazed that they have won prizes just for searching the Web. 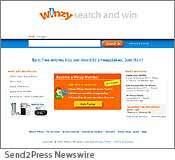 Winzy, LLC (www.winzy.com) is one of the fastest-growing search engines to offer rewards for simply searching the Web. Winzy was founded by successful entrepreneurs and includes early employees from Yahoo Inc., Adobe Systems Inc., and the designer of the Google logo. Winzy is a private company based in Mountain View, Calif.